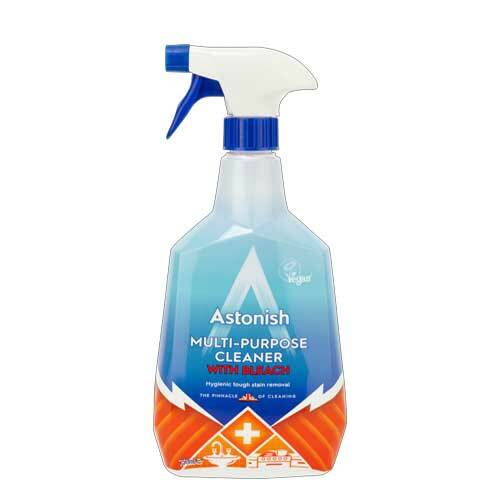 Astonish Multi Purpose With Bleach is for use on surface all around the home, including bathroom and kitchen. With the stain removing power of bleach for when you need that extra helping hand to remove tough stains leaves surfaces hygienically clean. Leave for a minute to take action before wiping clean to deliver maximum results. When it comes to our Multi-Purpose cleaner we’ve added the stain removing power of bleach. Its oxidising agents will give you an extra helping hand to break down those tougher than usual stains whilst leaving you with the reassurance your surface are hygienically clean. Job done. Spray and leave for 1-2 mins. Wipe with a clean damp cloth. Rinse plastics, rubber and metal surfaces after application using clean water. Caution: Contains chlorine bleach (sodium hypochlorite). Do not mix with other cleaning products. Wipe up spills immediately. Avoid use on aluminium, painted or varnished surfaces. Do not use on fabrics, wood or paper as colour change may occur. Check colour compatibility with natural stone.